MIMOSITO® is based in LA, the founder is a creative graphic designer who loves to travel and collect scarves. To satisfy her obsession with scarves, she is inspired to open a studio that primarily sells scarves in hope to share her beautiful collections with people from around the world. We work closely with designers and factories to produce the best quality possible. Our name, MIMOSITO® came from the combination of two Spanish words: Mimoso + Osito. "Mimoso"- meaning cuddly, someone who enjoys being given affection or wants to give affection in the form of physical contact. The suffix "Osito" - means little bear. Who does not love to cuddle with a little bear? We are scarf lovers who enjoy the feeling of cuddling. Scarves make the perfect cuddling partner whenever, wherever you want. It not only feels great but also gives you style while keeping you warm. They are wonderful gifts people love to receive and will appreciate and remember. These lightweight scarves are not just for the colder weather, they are one of our favorite accessories of all time and works perfectly on a warmer summer or spring day. EUROPEAN DESIGN - Uniquely designed by our pattern artists and neckwear designers in Spain. We strive to provide the best scarves, neckwear, shawl, wrap and foulard with fashionable, trendy designs. Our elegant designs makes a perfect gift option for you are your loved ones! Scarves are amazing and can take almost any outfit up a notch. 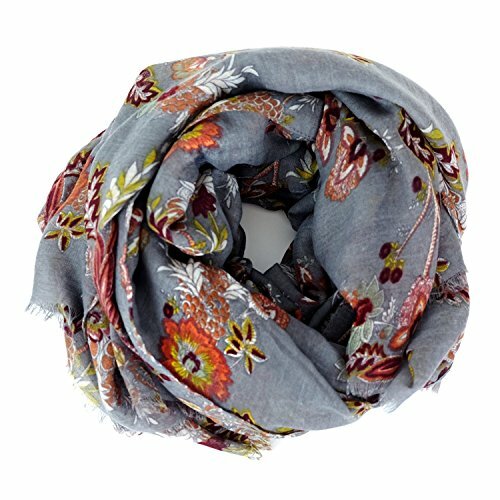 PREMIUM QUALITY - 100% viscose soft, lightweight scarves with multiple designs available. They are comfortable, warm, fashionable and versatile lightweight material that brings you simple & effortless style. We dedicated to provide products in high quality and reasonable price. QUALITY CONTROL: We have strict quality control over the production of our products. We carefully source our fabrics and ink from certified suppliers to ensure the best quality to pass state regulated environmental standards. FASHION STYLING: Fashion sheer scarves can mix and match for any type of Coat, Jacket, Blouse, Sweater, Shirt and Dress. Can be worn as neck scarves, summer shawl, beach wear, head scarf, wrap skirts, long, infinity, hijab, knotted, twisted, wrapped or doubled around neck, shoulders and head. Multi-purpose accessory on daily go-out, evening party, holiday or special occasions. 100% Satisfaction Guaranteed: Free return / refund with no question asked. If you have any questions about this product by MIMOSITO®, contact us by completing and submitting the form below. If you are looking for a specif part number, please include it with your message.